Here are the top 20 mini bluetooth speakers of 2019 that are small, compact and designed to be extremely sleek and powerful. These mini bluetooth speakers deliver superb audio performance despite their small size, and have long lasting battery life and advanced bluetooth streaming for the best quality audio. In fact, some of these speakers are so small that they are just the size of an egg; they can easily fit into your pocket or be tied to a key chain for you to take them virtually anywhere. We were quite surprised by the sound performance of the mini speakers on this list – they delivered exceptionally loud, crisp and crystal clear audio despite being so lightweight and small and can easily fill a room with music. At the time of writing, some of these amazing mini bluetooth speakers are selling at a very good prices, so be sure to check them out below! 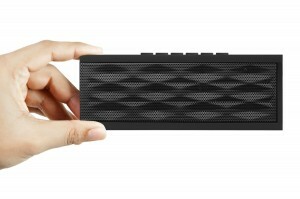 The X-Mini KAI XAM11-B Mini is one of the best mini bluetooth speakers you can buy now selling at a very good price. It is loaded with a 40mm driver to give you that extra edge over the conventional 36mm drivers when it comes down to sound quality. The KAI also expands to create a larger resonance chamber and produces up to 8 hours of continuous quality playback with its embedded rechargeable battery. The speaker also include a built-in mic for easy hands-free calling, and features Bluetooth v2.1 + EDR with A2DP stereo support for high quality wireless audio streaming. Furthermore, you can even daisy chain multiple X-minis together using the stowaway 3.5mm audio jack – once you send music to one Bluetooth connected KAI, you can enjoy sound from every connected speaker. 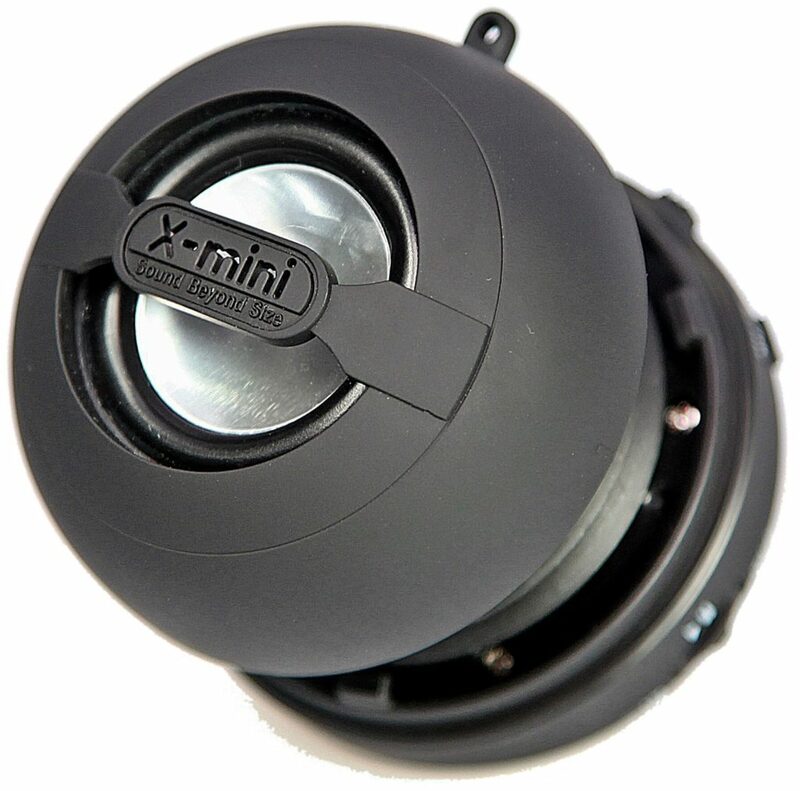 We were quite impressed by the sound of the X-Mini given its size – although they will not produce as loud a sound as full-fledged audio speakers, they do pack a punch. These mini bluetooth speakers do have exceptional sound quality, with very great clarity without much distortion at maximum volume and decent bass (for its size) when you extend the resonance chamber. Dialog in movies is clear and there is plenty of bass for music. The speaker comes in a quality clear acrylic case with a nice travelling pouch, which is a really good added touch. Pairing to the X-Mini KAI is super easy – once your Bluetooth device is switched on, you can simply search for it and pair instantly. Every time you turn on the speaker, it will pair perfectly with no problems. The build quality of this mini bluetooth speaker is superb and doesn’t feel cheap at all – everything seems to be very well made and of good quality. We also tried the X-Mini with Skype and it produced clear static-free sound during the call. The built-in microphone function is very convenient if you need to take hassle-free calls. It’s great for a desktop when you want to listen to your digital music and take calls without the need to dig for your phone. You can also accept calls on the go while listening to music. The built-in battery is rechargeable by USB and offers an impressive 8 hours of playback time. The entire package comes with the X-mini, USB charging cable, carrying pouch and user manual. The Verdict? The X-Mini KAI is one of the very best mini bluetooth speakers that you can find on a budget, with very decent sound performance and quality sleek design. We really liked the crisp, clear sound produced by the 40mm drivers and the ability to extend the resonance chamber for more bass output. Furthermore, the in-built microphone allows you to take hands-free calls while listening to music on the go. If you are looking for the very best mini bluetooth speaker with the versatility and the quality, the X-Mini KAI may be your best bet. 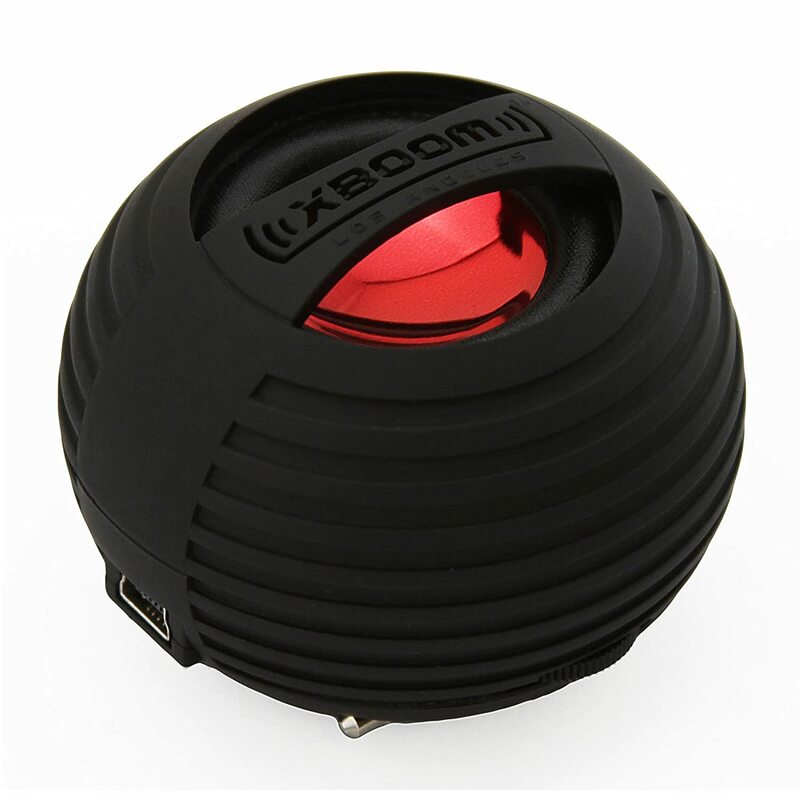 The XBOOM Mini is an exceptional mini bluetooth speaker and one of our personal favorites. The speaker has virtually all the functions you need in a quality speaker of this size – it has enhanced bass and expansion system to enable full-bodied, 360 degree sound with a 40mm driver 3-Watt output. It has an ultra-portable compact size with long-lasting embedded battery which provides a whopping 12 hours of continuous battery life from a single charge. It features a modular “buddy-plug” design, with an integrated stowaway 3.5mm stereo jack and socket for you to connect multiple capsule speakers together for maximum sound. It is universally compatible with any device that has Bluetooth, which means you can connect this mini bluetooth speaker to all iPods, iPhones, iPads, Samsung Galaxy phones, Android phones. At the time of writing, this sweet mini bluetooth speaker is now selling at a very good price and is definitely worth checking out. Our overall impression is that the XBOOM is a great speaker for mobile phones, PCs, laptops, tablets and video players. You can quality sound out of this speaker, and the ability to connect a few at the same time really adds to the punch. The speaker uses a bass expansion system with a sound resonator that enhanced the quality of the sound and bass response, although the bass output correlates with the size and drivers of the speaker and you should adjust your expectations accordingly. After listening for an extended period of time playing everything from rock to jazz to classical and audiophile recordings, we felt that this speaker actually performs above its price tag. The volume you can achieve is significant though not earth shaking, but the quality of the audio is just about the best we have heard from any speaker in this price range and category of mini bluetooth speakers. A key feature of the XBOOM is that it closes for portability and locks into a small package. You can open up the resonance chamber when you want to play music and get better bass response. The speaker is very lightweight at 2 7/8 ounces and is very portable. You can take it virtually anywhere that you need to listen to music, audiobooks, movies or podcasts. 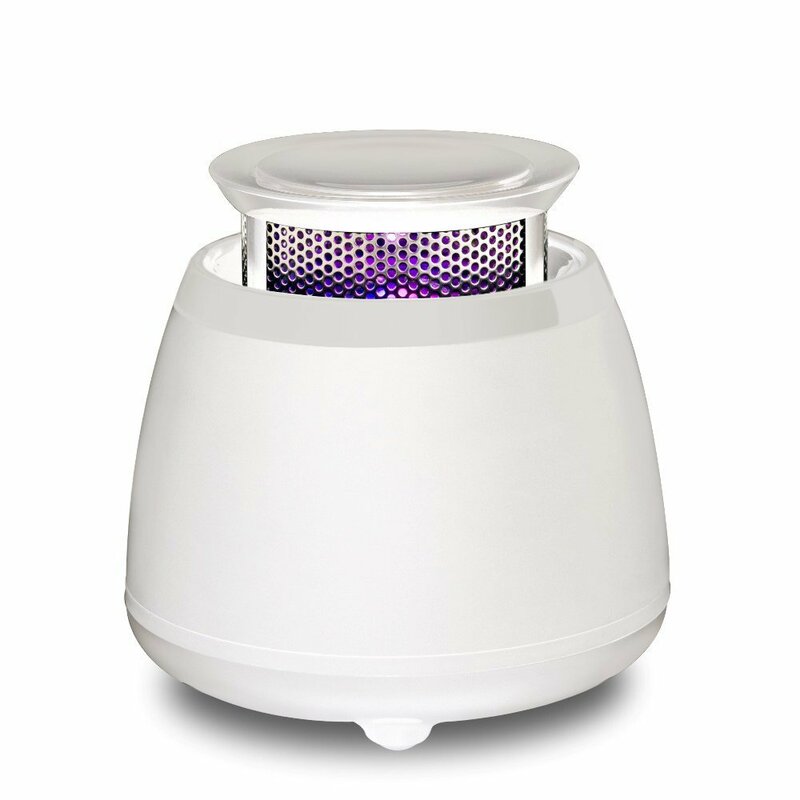 When opened, the upward firing speaker reproduces audio without muffling the sound quality. The unit features a very good lithium battery that is rechargeable and takes only 2 hours to charge, while producing 12 hours of playback time on a single charge. On the bottom of the speaker you will find a 3.5mm audio plug cable that you can link speakers together or plug the speaker into your audio source. The XBOOM comes with a handy carrying bag, a charging audio cable and brief instruction manual. You can charge the speaker with your PC or with any USB AC wall adaptor. The charging cable is 8 ½ inches long and the audio cable is 26 ½ inches long. When the speaker is charging the LED on the bottom is red and turns blue when fully charged. The Verdict? 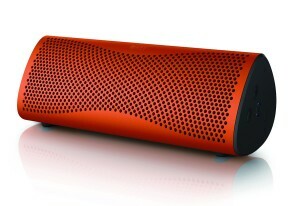 It’s quite rare to get as much value with the XBOOM Mini Bluetooth Speaker. It produces outstanding audio with its small but powerful 40mm, 3 Watt driver and expandable chamber to produce better bass resonance like a mini subwoofer. With a frequency response of 280Hz to 16 Khz it would be unreasonable to expect much lower end bass from this speaker – however you get some very decent audio production at pretty loud volumes. We really liked the fact that you can link up multiple XBOOM Minis together and the small audio cable is nested neatly at the bottom of the speaker for storage. Overall, the XBOOM is a really good mini Bluetooth speaker that delivers great sound performance and we highly recommend them. 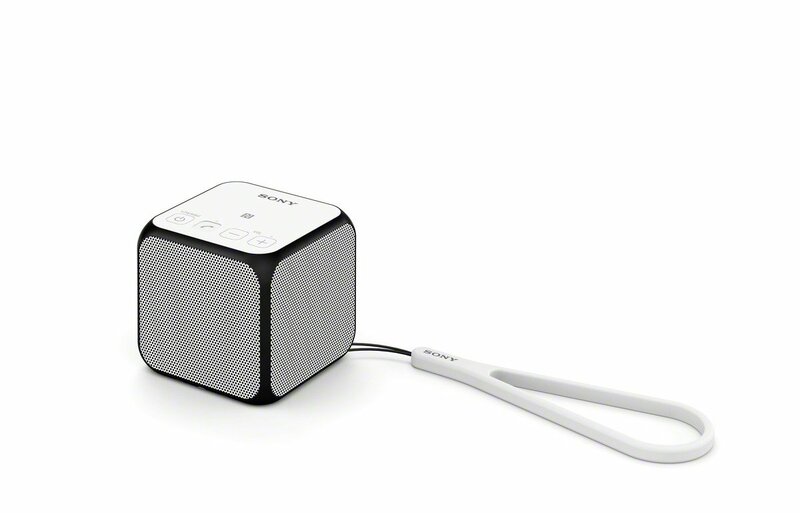 The Sony SRSX11 is one of the best mini bluetooth speakers and a fantastic compact speaker. For its mini size, it produces size-defying sound with 10 Watts of digital amplification, and comes with dual passive radiators for bigger sound. The speaker also has bluetooth audio streaming with SBC support, and convenient one-touch listening technology. The battery life lasts for a whopping 12 hours with a single charge and you can also take calls using the speakerphone functionality. It’s a very convenient speaker which you can charge via USB input and also comes with a silicon accessory strap to carry around. We really liked the design of the Sony SRSX11. This speaker is exactly the right size – small and compact – the whole speaker itself is covered in soft quality rubber. All three speaker grills are metal; the speaker looks like it can take a tonne of abuse and looks super nice on the outside. You can tell that Sony spent some time thinking about the acoustic design and not just the packaging. There are two passive bass radiators on two sides. The speaker is a closed design and has very little air inside. It will fit easily into your briefcase or pocket. The sound quality is pretty good for a mini bluetooth speaker. The midrange and highs are really clear and easy to listen to without distortion at high volumes. We would describe the sound as loud, crisp and clean. We liked the ability to split the speakers for spatial separation – you can link a second unit to take advantage of the stereo linking to produce much fuller sound. The bass feels a little closed up in part due to its design, but limited bass reproduction is to be expected from mini bluetooth speakers. In sum, this little Sony speaker has much bigger sound in the same size package with an enhanced battery life. The bluetooth connection is clean and simple. All we needed to do was turn the power on, go to your device and pair with the speaker. The speaker has volume control and there is a phone button to answer calls and the power button. The Verdict? The Sony SRSX11 is undoubtedly one of the best mini bluetooth speakers you can buy. We really liked the hefty feel to this small speaker and it looks so sleek even before using it. The sound is loud, distortion free, crisp, clean and has reasonably good bass. The sound is just incredible for something in such a tiny package. Setting up the Bluetooth is a snap. It’s the perfect companion if you want a portable bluetooth speaker that can easily fit into your pocket or bag or clip on, and its long lasting 12 hours of battery life makes this truly one of the best. The Marsboy Cube is one of the most elegantly designed pocket-sized mini bluetooth speakers we’ve come across, and is now selling at a very good price point at the time of writing. The speaker looks like a magic ring box which is easy to carry around to let you enjoy your music everywhere. It has a smooth curved edge for you to hold the Cube easily in your hand, and a skid-proof base to protect the speaker and the surface it sits on. 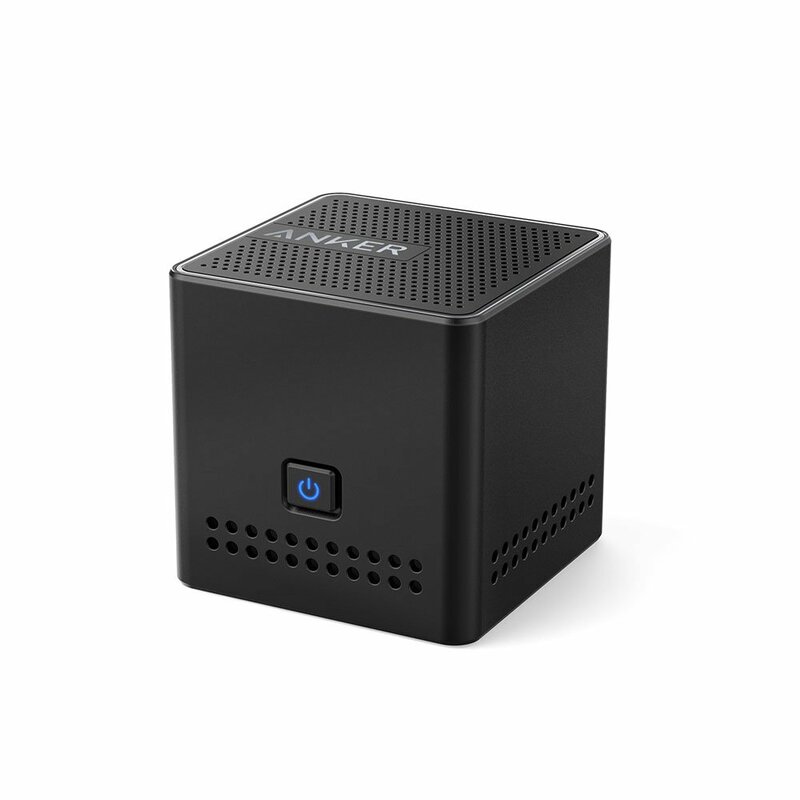 The Marsboy Cube is compatible with almost every single bluetooth device, and its easy control is designed with one button to help you get rid of messing up buttons of the speaker and your phone. The mini bluetooth speaker has an incredible battery life of 12 hours at 80% volume, which makes this a serious contender for the top spot. We found that the Marsboy really small and yet powerful. Packaging wise, it comes inside a very sturdy and well-designed small paper box. The box itself is sealed inside a thin plastic wrap. A USB charging cable is included. The Bluetooth pairing works like a charm – simply hold on button on the speaker and it will turn the bluetooth on (with blue lights) – after you connect you will hear a beep sound and you’re all set. We did not charge the battery before using it and found that the speaker lasted for several hours at 60% volume. On a full charge, we found that the speaker could go on for hours on – at the time of writing the speaker has been playing for at least 10 hours at 70% volume and is still going strong. The sound quality of the Marsboy Cube was really quite unexpected. The sound quality is good and the volume is quite loud for its size. We really enjoyed the crisp highs of the speaker, and is really convenient to bring around as it fits easily into your pocket. Not only is this speaker small and easily portable but it also has clear sound. The speaker starts to distort a little at 100% volume, but that is really to be expected from a speaker of this size. We found no issues when playing at 80% volume – in fact we really liked the overall audio performance which was warm and pleasant to listen to. We really liked the overall design of this speaker. As mentioned above, the bottom of the unit has an anti-slip rubber layer and the side seems to be metallic with ABS coating. It feels high-tech and of good quality. At this price range, you are really getting a nice and affordable quality mini bluetooth speaker. The Verdict? We were pleasantly surprised by how good sounding the Marsboy Cube was – it’s quite stunning that such bold and clear sounds can come from such a small speaker. With its surprisingly superb audio performance and clean, sleek design, we have no doubts that the Marsboy Cube is among the very best mini bluetooth speakers selling at an affordable price. At the time of writing, the Marsboy Cube is now selling at a very good price so be sure to check them out! The JBL Clip is one of our personal favourites and is truly one of the best mini bluetooth speakers you can come across in terms of sound performance. The speaker itself provides wireless bluetooth streaming for high quality audio in addition to a speakerphone which you can take calls with a touch of the button. The speaker is designed to be splashproof which means you can carry it under rain or spills or clean it with running tap water – just don’t submerge it. The mini bluetooth speaker comes with a built-in carabiner for you to clip onto anything you see fit and take it on your outdoor adventures. The rechargeable battery allows you up to 5 hours of playtime on a single charge. We found that the sound performance of the JBL Clip was quite impressive for a speaker of this size. It produces clear and clean sound which can go quite loud. It produces surprising sound for a small package. We found that this speaker even produces decent bass response. The speaker does not distort (or minimal distortion) at maximum volumes. A significant plus is that you can use this speaker while it is plugged in and charging. That said, we found the battery life somewhat lacking at only 4 hours plus when played at maximum volume. This is made up in part by unbeatable sound produced by this mini bluetooth speaker. We found the JBL Clip very good for travel or backpacking in general. The carabiner clip is extremely useful and you can clip this speaker in any way you want or position it for the best listening conditions. It’s really nice to go on a hiking trip knowing that this speaker is water resistant and will survive the outdoors without being damaged. The speaker itself is very lightweight; it’s an absolute champ in terms of portability. The design of the speaker was also very sporty and clean; it comes in a multiple selection of colors for you to choose from which is pretty cool. All in all, the JBL Clip is a sporty and classy looking mini speaker. The Verdict? The JBL Clip is one of the best sounding mini bluetooth speakers and is an excellent speaker for travel and sports activities. We were quite surprised by how loud this speaker can go and it still sounds clear and good without distortion. Furthermore, this speaker is designed with a clip for you to conveniently attach it to anything while travelling on the go. That said, we found the battery life of this speaker somewhat lacking, and at full volume this speaker would only last around 4 hours of playtime. This is mitigated in part by the ability to charge and play the speaker via USB, or to a mobile powerbank. If you are looking for an excellent mini bluetooth speaker that is compact, extremely portable and produces quality music and aren’t too fussy about battery life, the JBL Clip is an outstanding choice. The GRV6579 is one the sleekest and most compact mini bluetooth speakers we have come across. It’s designed to be as minimalist as possible. The chic and modern GrvMini fits easily into your pocket, handbag or the side pocket of your backpack. The speaker produces full, clear high definition sound with good bass for its size through its dynamic 40mm audio driver and bass resonator. You can pair virtually any bluetooth device with the GRV6579 for up to 10 meters / 33 feet or connect non-bluetooth devices such as mp3 players or laptops using the 3.5mm AUX cable. The battery life of this speaker lasts a good 6 to 7 hours on a single charge, and you can recharge the speaker in 2 hours using the included mini-USB cable. Overall, the GRV6579 is an incredible mini bluetooth speaker that is definitely worth checking out. The GRV6579 is unique in that you can “open” up the speaker like an accordion. You can hold the top of the speaker with one hand and the bottom with the other and twist it counter-clockwise, which will open up the speaker and allow you to get the most bass out of it. We found that doing this makes a big difference in the quality of the sound produced. When you are ready to get it back to its transportable state, simply press the top and the bottom together and then twist clockwise. We found this quite an interesting mechanism that helps you get the most sound out of this compact mini bluetooth speaker and yet retain maximum portability. You can even connect multiple GRV6579 speakers together for an even bigger sound. The GRV6579s are one of the smallest mini bluetooth speakers we have ever tested. In fact, these speakers are so small you can easily fit them into your pocket. The sound that these speakers produced was crisp, solid and clear, and can go to a very decent volume. It’s very nice to have great sound with the added portability and without the fuss of wiring. That said, this speaker does start to distort a little at maximum volume; a good range to be at is at 80% volume for the best sound quality. You can also use the built-in audio cable to hook it up to more speakers for even bigger sound. Connection wise, these speakers work like a charm. You can take it out of the box and it immediately syncs to your mobile device and play music. The Verdict? The GRV6579 is one of the most compact and sleekest mini bluetooth speakers we have ever reviewed, and also includes an innovative mechanism where you can actually “open” up this speaker to enhance the bass output and sound quality, and close the speaker while on the go for added portability. The bluetooth connection on this speaker is flawless; you even have the option of connecting multiple speakers together to produce bigger sound. We really liked the nice small sized design of the speaker and good sound output, with its decent battery life of 6 to 7 hours of playtime. Overall, the GRV6579 is a very well-rounded speaker and especially suited for those who require portability – at the time of writing this awesome mini bluetooth speaker is selling at very good price point so be sure to check it out! 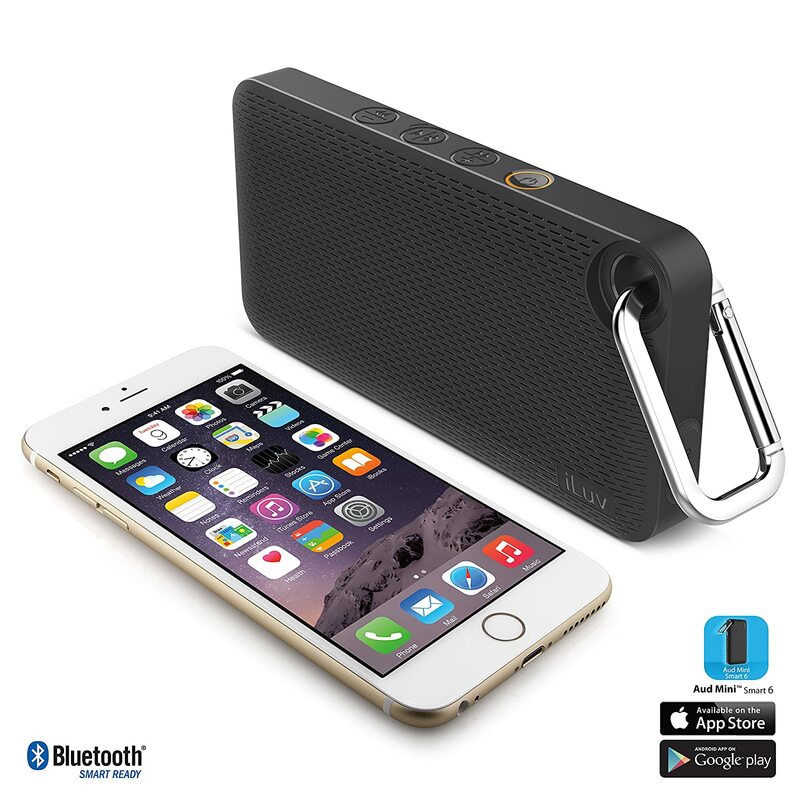 The Aud Mini Smart 6 by iLuv is a small, slim and compact mini bluetooth speaker providing full-ranged sound. It’s one of the sleekest mini bluetooth speakers we’ve come across with multiple functions, including an app that lets you pair to your mobile device, listen to FM radio and toggle panic alarm. This speaker allows you to stream music wirelessly via bluetooth with a built-in microphone for hands-free phone calls. It’s also rugged and splash-proof, and its small size makes it easy to carry by hand and it can also be clipped to bags with its carabiner. The speaker features a dual color LED to indicate power and charge status. The Audi Mini is designed to be exactly the same size as the iPhone 6 or Samsung S4. The first thing we noticed is how light and smooth this speaker was. There are four rubber bumps on the back on the corners which helps with laying it on its back and securing it to the surface. It has a little slide switch next to the charging port and also a very small and dim blue light on the front that blinks red when the speaker needs a charge. We found the speaker to be very light and sleek. The built-in carabiner is perfect for travel and outdoor adventures and a nice added touch. In terms of audio performance, we found that this speaker has a solid range and impressive volume. It delivers good sound for half the price and half the weight as other conventional bluetooth speakers. We were quite surprised that the sound can go reasonably loud and powerful for such a small and inexpensive speaker. It’s especially nice to play this speaker at the beach or park or in open spaces due to its portability. Although this speaker doesn’t exactly have the bass or richness of say, a Jambox bluetooth speaker, bear in mind that this mini bluetooth speaker costs and weighs considerably less and is way more portable. We found that the battery life is pretty good for how small and light this speaker was – you can definitely get up to 4 to 5 hours of playback on a single charge at 70% volume. You can pair this speaker quickly to any mobile device – the audio controls give volume up / down, play, pause and skip without any issues. We felt that this mini bluetooth speaker is perfect for throwing in your pocket and turning your phone into an anytime mini-boombox. The Verdict? The Aud Mini Smart 6 is definitely one of the sleekest mini bluetooth speakers available on a budget. It’s extremely portable, lightweight and shaped exactly like an iPhone for easy travel. You can even use the built-in FM radio without using the companion app. The bluetooth functionality works seamlessly with all the mobile devices we tested it with. The sound is also well-balanced and reasonably loud for a speaker of this size. If you are looking for a sleek, budget but good sounding mini bluetooth speaker, the Aud Mini is definitely something that deserves your attention. The Etekcity RoverBeats T3 is one of the best mini bluetooth speakers you can find in terms of audio performance and portability. It is also one of the most impressive mini bluetooth speakers in terms of specifications. The speaker comes with a CSR 4.0 bluetooth chipset, with 3W rate power and enhanced bass resonator for enhanced audio performance and sound quality. It also features a built-in mic which supports hands-free phone calls and outstanding bluetooth connection of up to 33 feet, including up to 8 hours of playtime powered by an internal lithium battery. The easy Bluetooth connection works with all Bluetooth-enabled devices, smart phones, pads, laptops and desktops, and a 3.5 mm audio jack for non-Bluetooth devices. It even comes with an anti-skid mat on the bottom of the speaker to add stability, multi-hole silicon protective layer to avoid slipping and a carrying pouch. To top it off, this amazing speaker is now selling at a very good price point. We found that the audio performance of the T3 outstanding. It produces deep, rich bass, with amazing volume that can get decently loud. We found that there was no static with the Bluetooth connection. The Bluetooth connection easily extends more than 30 feet as promised; you can walk around your home with your mobile device and the music will still play without any static. You can keep the speaker blasting for the whole day and have no issues with battery life. You can really feel the effort that the manufacturers put into designing the T3. You can actually feel the quality of the speaker when holding it in your phone while playing music – it can just about vibrate out your hand with the amount of juice that these drivers produce. The speaker rests firmly on most surfaces thanks to the non-skid ring on the bottom. In addition, the non-skid ring keeps it from vibrating and no unwarranted noise is produced. In terms of portability, you can hook up the T3 to just about anything. This mini speaker will work right out of the box – all you need to do is turn the speaker on, turn on your Bluetooth and tap the T3 icon once and your phone will automatically connect. You can also plug in the included audio jack if your device does not have Bluetooth. You can also adjust the sound output via your EQ settings and the T3 will adapt. We have tested many mini bluetooth speakers and were impressed by the solid audio performance of the T3. At full volume, the quality does not break or distort at all. The Verdict? 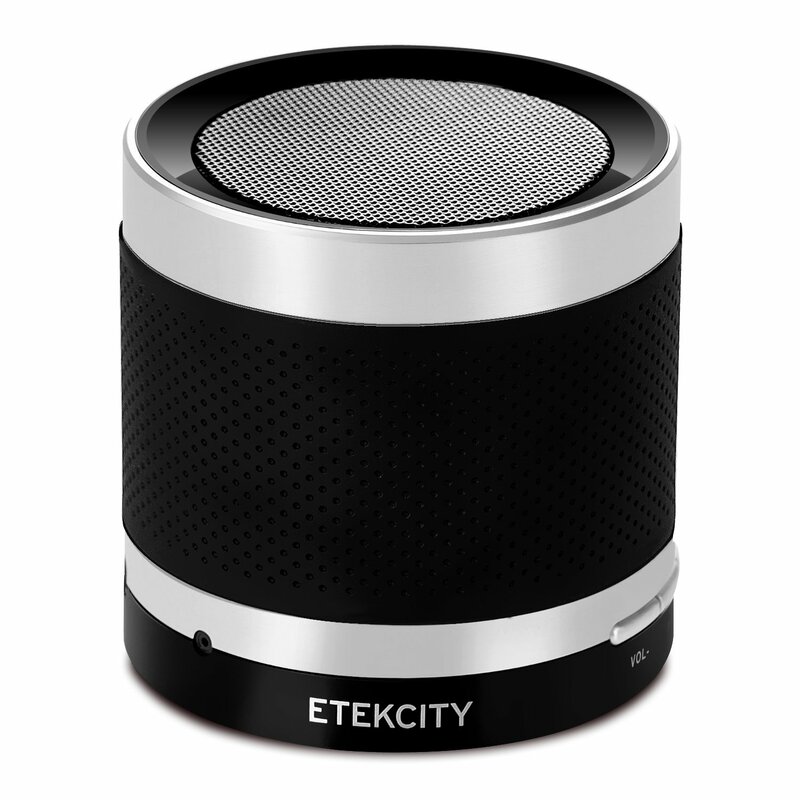 The Etekcity T3 is a high quality and one of the most impressive mini bluetooth speakers in terms of design and audio performance. We were quite surprised that the T3 could pump out decent amount of sound without any static or distortion, and we liked the overall design of the T3. You can feel instantly that the manufacturers took pains to ensure every detail on this speaker was well executed and taken care of. It’s a very compact and small speaker that is able to incorporate bass and actually sounds great – it shakes the table and you can feel the quality through the vibrations it produces while playing music. At the time of writing, the T3 is now selling at very good price so don’t forget to check it out! The Anker Ultra is one of the most impressive mini bluetooth speakers that we have tested that really produces quality audio performance. The speaker produces full, high definition sound which allows you to enjoy an impressive robust bass through a 3W audio driver and passive subwoofer. The speaker has an impressively long playtime and fast recharge capability; it allows you up to 12 hours of music at 80% volume, up to three times longer than standard mini bluetooth speakers. It’s also incredible compact; the ring box-sized bluetooth speaker will fit easily into your jacket pocket or the small side pocket of your backpack (45mm /1.8in). The Anker Ultra also comes with a 2.3 ft Micro USB charging cable, 2.3ft AUX to Micro USB audio cable, and an 18 month warranty. It’s definitely one of the highest value-for-money mini bluetooth speakers you can find. Design wise, the Anker only weighs in at 3.17 ouches but it can easily play your music, audio books, videos or recorded lessons with perfect clarity. You can charge this speaker’s internal battery in 1 ½ to 3 hours and it will provide up to 12 hours of continuous play time in a single charge. You can also charge it with your computer’s USB port, an AC USB wall charge or a vehicle USB charger. It features Bluetooth 3.0 connection for higher quality audio transmission and has NFC (Near Field Connection) capabilities. We found that the connection distance can go slightly above 33 feet. The speaker produces very good sounds and good volume for its size. It utilizes a 3 watt audio speaker that performs above par. The sound is the reason this little speaker excels so much – it can get incredibly loud for its tiny size and we never heard any distortion or bad sound. The speaker does not have a volume control and you adjust the volume output level by using the volume controls of the device you are using to create the sounds. Pairing the speaker is fast and easy and quick. That said, the speaker does not include a microphone so you have to make your phone calls using your phone. Based on the sound performance alone, we would say that this is a powerful mini bluetooth speaker with lots of guts. The Anker itself is really lightweight – it even has a bit of rubber on the bottom surface so it does not slide around easily with the minor thumping from the bass. When you do need to charge this speaker, you can use the included Micro-USB cable and nearly any USB wall charger, since it only requires a 0.5 input in order to charge. One nice added features is the auto-off, which occurs a few minutes after the speaker being on but not connected to any device. The Verdict? It’s ridiculous how the manufactures can fit a driver this good with a battery that lasts so long in such a tiny package. The Anker Ultra truly impressed in almost every aspect; the only aspect which we found lacking was that it does not have a microphone so you cannot use this to make calls. This is no biggie to us though, considering how good the sound performance and bluetooth connectivity was. Considering that this speaker is a really good mini speaker you can find on a budget, we would highly recommend the Anker Ultra. The AUDIST mini bluetooth speaker is a sleek, modern and durable speaker that provides a complete portable solution for those who need good sound and the durability of an outdoor speaker. It comes with a 2-inch Kevlar cone speaker, 2-inch bass radiating element and an anti-vibration pad to provide a smooth and full sound. The speaker is compatible with any Bluetooth enabled phone, iPhone, iPad, tablet or laptop. It also features two-way hands-free calling, easy controls and a built-in microphone for you to take important calls. The rugged design and elastomeric coating also improves the durability of the speaker. On the whole, the Audist is a cool looking small speaker that delivers big on sound quality. The AUDIST comes in a nice package which includes a user guide, line cable, micro USB and USB charging cable and a carabiner clip. The speaker itself measures only 3 ¼” in diameter and is 1 5/8” thick, and is very easy to use and delivers good quality audio. You can also plug this into devices that are not bluetooth compatible using the included AUX cable. Pairing with the AUDIST is easy – simply set the Control Toggle Switch to Bluetooth mode and select ADUIST from your device’s Bluetooth menu. Once connected, a blue LED light flashes slow and then beeps to indicate pairing completed. We noticed that when the volume is turned up, the superb bass output will causes vibrations and the silicone grips on the bottom of the unit prevents it from bouncing too much. The speaker itself puts out clear, distortion free sound even at high volumes. We were able to listen to music for several hours before needing to recharge the unit. To put it simply, the sound of this speaker is amazing, loud and very clear. We were quite surprised that such a small speaker could pump out so much sound and how they could get the bass to sound that good. The speaker takes less than 2 hours to full charge which is pretty good. We really liked the addition of the carabiner clip, which you can use to attach the speaker to a belt loop, backpack or just about anywhere else for use while on the go. The sleek design is attractive and unobtrusive and the compact size allows it to fit in the smallest of spaces. You can even clip it on your backpack and listen to music while riding on your bicycle to enhance your journey. The Verdict? The AUDIST feels like a quality speaker in every way – it feels heavy and well made, and the battery life is superb up to a whopping 12 hours. We were genuinely impressed by the sleek design and the excellent audio performance, with loud and crystal clear sound without any distortion at maximum volumes. 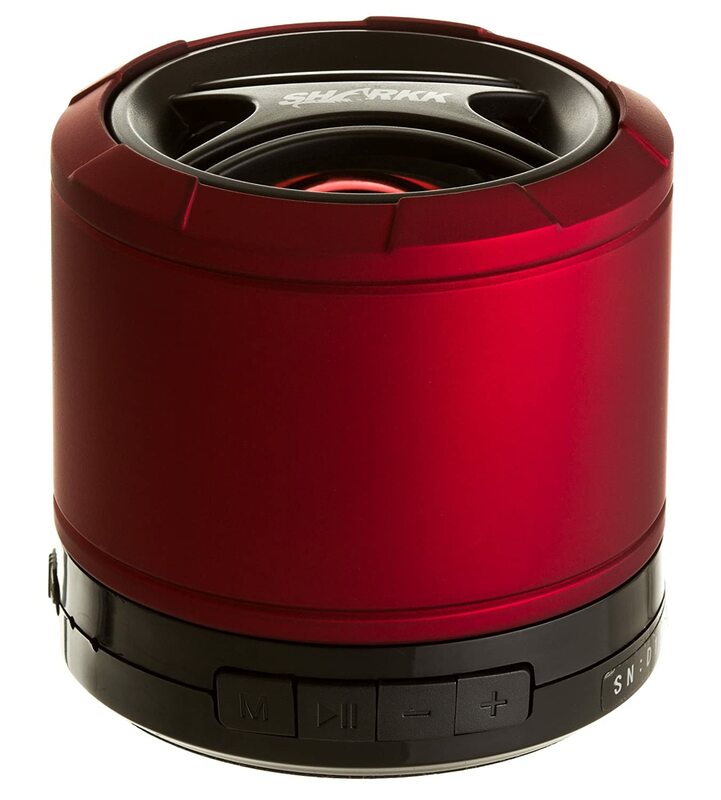 It even pumps out quite a decent amount of bass for such a small speaker, and was extremely fun to take outdoors or on bicycle rides with the in-built carabiner clip. The AUDIST is no doubt one of the best mini bluetooth speakers we’ve come across that is definitely worth checking out. 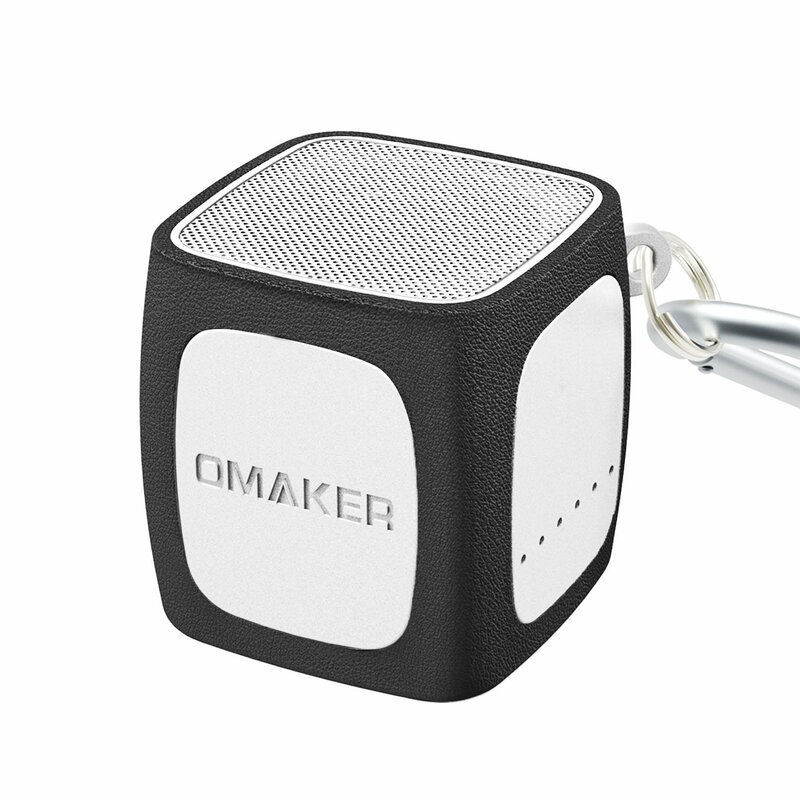 The Omaker W4 is one the cutest and powerful mini bluetooth speakers we’ve come across. Even though the W4’s size a 1.9in, 3.5oz cube, it comes with a dedicated 40mm driver that packs a powerful punch and delivers crisp, high quality music with the added portability. The battery life is a superb 12 hours of playtime and is easily rechargeable with the included micro USB cable. The bluetooth connectivity is good for up to 30 feet, which is pretty good for a speaker of this size. The W4 is one of the smallest mini bluetooth speakers on this list – you can easily fit into your purse, pocket or desk without being obtrusive. It also comes with volume control and you can move through your soundtracks directly on your smartphone or mobile device. All in all, the W4 is an ultra-compact speaker and a great option for those looking for portable cube mini speakers. The sound quality of the W4 is pretty good considering the size – it’s probably one of the most balanced for the size of the speaker and the quality of the materials. The W4 gets really loud – at 75% volume this speaker was already quite loud – you can have it on the kitchen table and you will be able to hear the music clearly from surrounding rooms. We found that music crystal clear at normal listening volumes but does distortion as you go to higher volumes (90% to 100% volume), but that’s expected from speakers of this size. The W4 does not shake or move while being played on maximum volume; we felt that it was stable and clear sounding on the overall. The build quality of the W4 is amazing. This cube is made of a solid metal frame with plastic sides and feels high quality. It’s also rapped in a rubbery like material to improve stability on surfaces. The rubber also helps to add to your grip while holding onto it and is removable as well. The ring attached to the speaker is made of sturdy plastic and you can use a carabiner clip to attach it to your backpacks or anything else in that you want to carry around. We felt that the W4 is a very nice little speaker to have and easy to transport around. It’s especially good for outdoor travel and small outings without the fuss of carrying around a bigger speaker. The bluetooth is extremely easy to set up – simply hold down the power button to sync and you’re all set. Compared to other bluetooth speakers, the W4 certainly holds its own with is superb audio performance and sleekness. The Verdict? The W4 is certainly one of the best mini bluetooth speakers around which demonstrates that quality does come in small packages. It’s designed to be extremely portable and has quality metal finishes and rubber coating to improve durability. The sound performance is surprisingly good with its in-built 40mm driver and can get decently loud. It also comes with an in-built ring which you can attach to your backpack so that you can play music wherever you need to with easy access. At the time of writing, this incredible mini bluetooth speaker is a really good speaker you can find on a budget, so don’t forget to check it out! 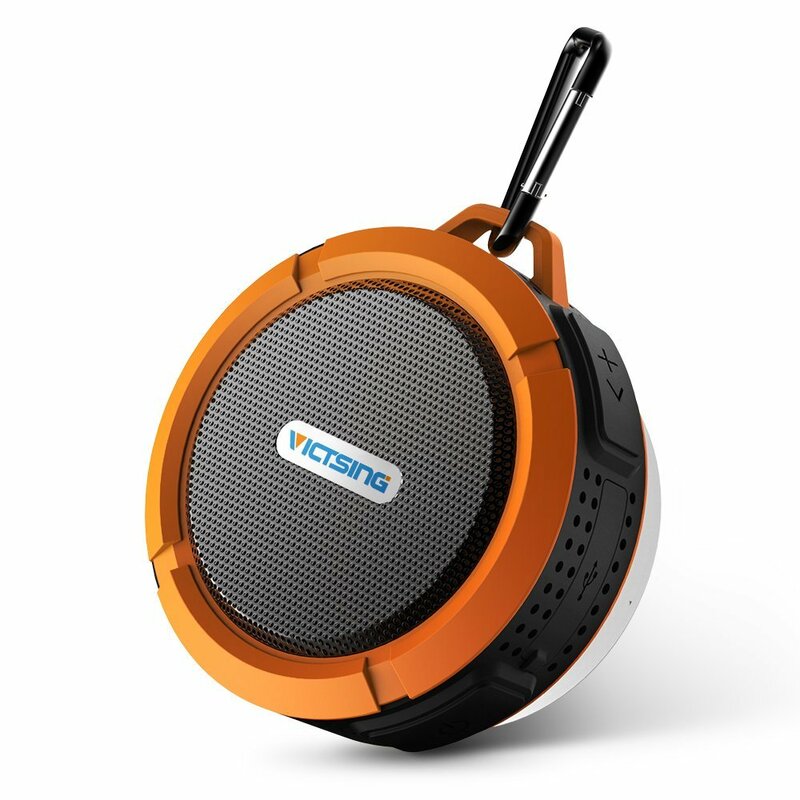 The VicTsing is a rugged and one of the most beautifully crafted mini bluetooth speakers on this list designed for extreme portability in rugged conditions. The speaker is encased in a beautifully sealed silicone casing and interface designed to ensure that it is waterproof, shockproof and dustproof, and can easily be brought under harsh environments. It also supports A2DP and has a dedicated 5W speaker to stream quality stereo sound with full range output, with clearly articulated high ends. It has a built-in MIC bluetooth speaker and hands-free function so you can conveniently pick up a call with this mini bluetooth speaker from virtually anywhere. The built-in rechargeable battery supports up to 6 hours playing time at 70% volume. The speaker is very small and compact, and roughly 3.5” in diameter. The outer body itself is made of a rubber material that looks incredibly sturdy – no rain, snow or wind is going to damage this speaker. Setting up this speaker was a breeze – simply hold the search button to locate the Bluetooth source and connect with your mobile device. We experienced no issues pairing this device and everything was completed in less than 30 seconds. We were quite blown away by the audio performance of the VicTsing. The sound is simply outstanding – we were quite surprised you can get so much sound from such a small and compact mini bluetooth speaker. The speaker does get very loud and produces crystal clear music even at near maximum volumes without distortion. We could not find any faults with the music performance; we would describe it as outstanding in every way. With a dedicated 5W driver, the manufacturers really managed to create such a good sound speaker from such a small package. We also found that the lows, mids and highs were not bad and it also has some bass to it as well. This is taking into consideration that it is pretty sealed up for water resistance and still produces crystal clear sound. The speaker itself is well thought out – it comes with a micro USB charging cable and user manual. It also includes a carbine for the loop up top, which is very convenient to attach to your backpack or bicycle while on the go. We also really liked the weather resistant design – you can take it anywhere out without worrying about water, dirt, snow, etc. The speaker also has a rubbery exterior that lowers the chance of a slip drop and can be cleaned without worrying about scratches. It even comes with a suction cup which is great for windows and car windows. In short, this is probably among the most heavy duty and portable mini bluetooth speakers you can get. The Verdict? We were highly impressed with the heavy duty design of the VicTsing and its incredible audio performance. Apart from being water resistant, dust and shock proof, the speaker itself is designed to be extremely sturdy and portable and is easy to carry around. The rubbery exterior and high quality materials make this speaker feel high quality – you can feel how sturdy it is simply by holding it in your hand. We were also surprised that the audio performance could be this good even though the speaker itself is thoroughly sealed and compact. At the time of writing, the VicTsing is selling at a very good price and is undoubtedly one of the best mini bluetooth speakers on this list. 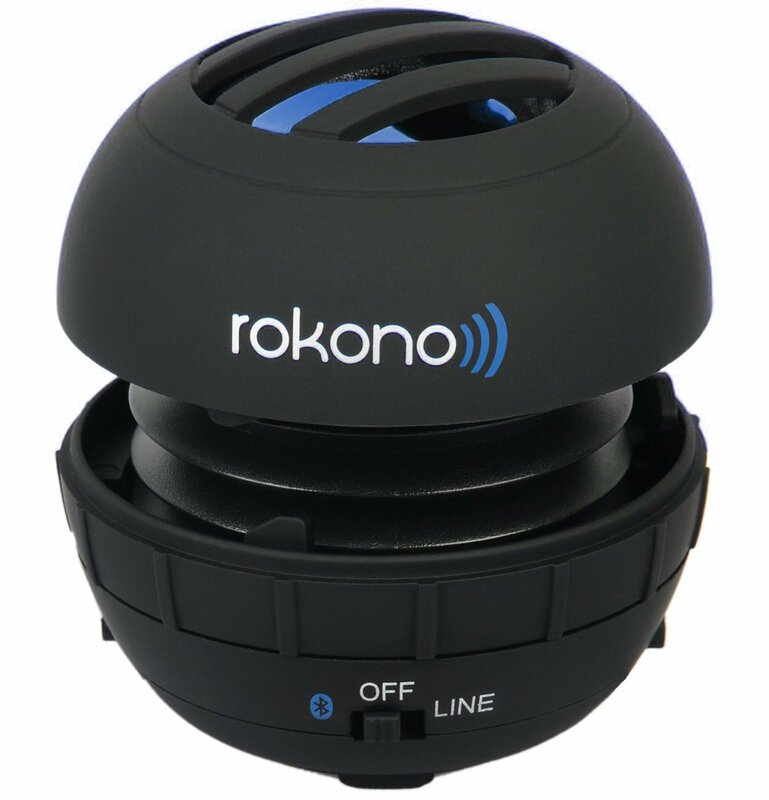 The Rokono G10 is an incredibly eye-catchy and one of the best mini bluetooth speakers, producing high quality, dynamic rich audio with good bass resonance. The speaker has a dedicated 40mm driver and unique expandable bass chamber which provides crystal clear sound. It also features long-life rechargeable battery, allowing a whopping 8 hours of continuous playtime and charges easily using a USB cable. The portable size of the speaker means that it will easily fit into your backpack, suitcase or travel bag. You can connect the G10 with virtually any Bluetooth device and it will work instantly, or connect via a built-in 3.5mm cable. At the time of writing, this incredible mini bluetooth speaker is a really good speaker you can find on a budget. The G10 package includes a USB charging cable, 80cm audio extension cable and splash-proof carrying bag for travel. We really liked the size of this speaker and how easy it was to toss it into a travel bag and take it on the go. The design of the G10 itself is very beautiful and we liked how it opens and closes for portability. The speaker itself is smaller than a tennis ball at 2 ½ inches in diameter and two inches tall when closed. It weighs in at 3 3/8 ounces and it is 2 ¾ inches tall when opened. It’s hands down one the most portable mini bluetooth speakers out there in the market. The sound performance of the G10 was really good and went beyond our expectations. The acoustics are very good and they are enhanced by the built-in base chamber that helps to emphasize the bass output of the music through its resonation capabilities. One neat feature that we also liked was the ability to link multiple speakers together to enhance the sound. We found that the G10 produces clear, loud sound at a decent 3W output. It also produces minimal or close to zero distortion at maximum volumes, which is quite a feat considering the size of the speaker. 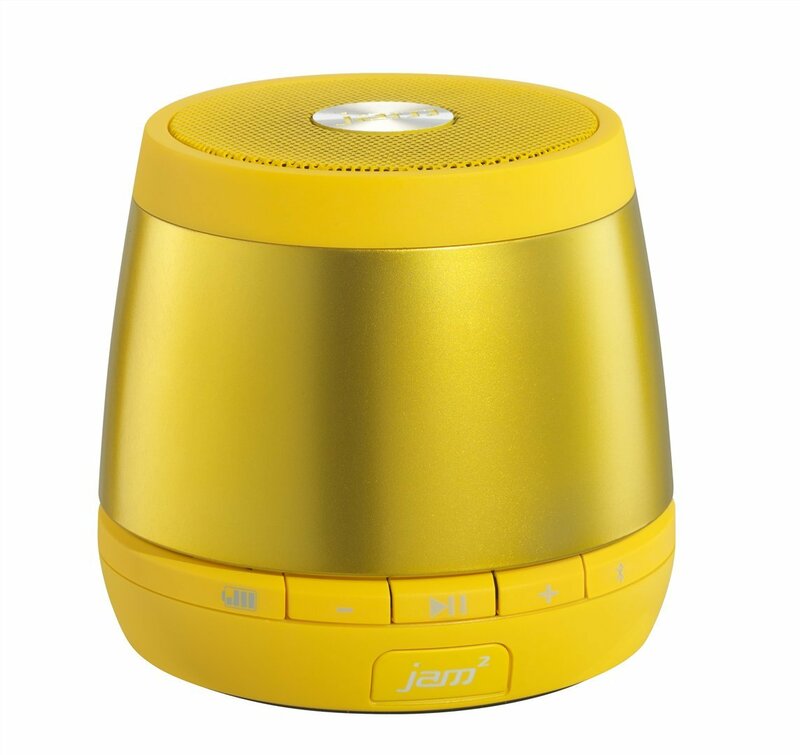 In fact, we felt that the acoustic quality of this mini bluetooth speaker really shines when it is sitting on a solid, hard surface, such as a desk. You can actually hear and feel the bass-line of the song, and you will be more than delighted that you can get it at a lower volume setting. We were very impressed by the overall sound performance of the G10. The Verdict? For the price and audio performance of the Rokono G10, it certainly doesn’t get much better than this. Furthermore, the G10 represents exceptional value for money. It’s one of the most efficient and well-designed mini bluetooth speakers we have tested. Trust us when we say we were impressed; you’ll be quite stunned at how such a small speaker can produce such clear and powerful audio, with accentuated bass and a dedicated bass chamber. It’s also incredibly portable and looks gorgeous from every angle – we absolutely loved it! The XSBOOM is hands down one of the smallest mini bluetooth speakers we have ever reviewed. 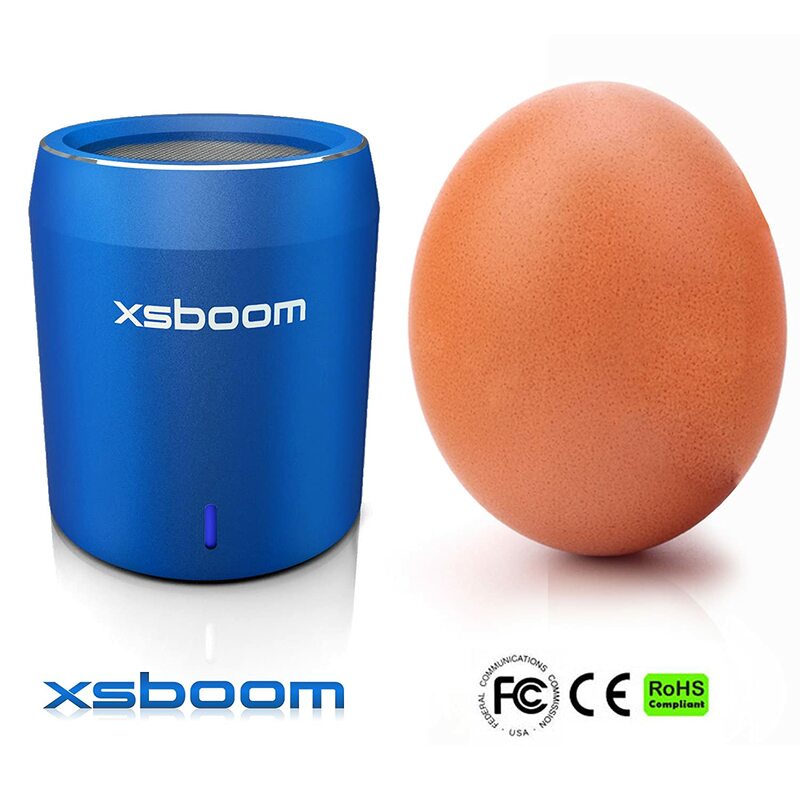 Measuring the size of an egg (1.9” x 1.7”), you can literally put it in your pocket and take the XSBOOM anywhere, period. Even though the speaker itself is extremely small, it produces big and solid sound. It comes equipped with a 3W driver that pumps out pretty decent and loud sound, with good clarity on its highs and mids, with a touch of bass. The speaker is powered by a 400mAH lithium battery which provides up to 10 hours of playtime and only takes 1.5 hours to charge via the included USB cable. It also has a built in microphone for you to take hands free calling and pairs with virtually any bluetooth device. At the time of writing, the XSBOOM Mini is a really powerful Bluetooth speaker you can find at a very good price, so check it out before it sells out! We felt that the overall quality of the sound of the XSBOOM was very good, especially for a speaker of its size. The clarity is just phenomenal; even at full volume there’s little or no distortion at all. The speaker may be small but the sound it produces is solid and loud. Furthermore, the speaker appears to produce some bass output which is quite a feat. It easily fulfils the music volume needs of a group surrounding a table or an outdoor picnic. The sound is rich and full and pleasant to listen to. The battery life is also incredible (approximately 10 hours) and is definitely long enough for travelling or exploring the outdoors. The XSBOOM is tough and surprisingly rugged despite its elegant and small design. The metal and silicone construction makes this feel rock solid and shows premium high quality engineering. We really liked the minimalist look to it and how easily portable it is. The bluetooth range of the XSBOOM is also very good – it can cast a good signal until about 70-80 ft without any issues. It can receive a good signal indoors from the next room over. The XSBOOM is a snap to sync and very simple to operate. All in all, it’s a really good mini bluetooth speaker that excels in almost every single aspect of its design and audio performance. The Verdict? We really enjoyed the XSBOOM – it’s by far one of the smallest, cutest and best performing mini bluetooth speakers in this category and definitely one of the best sounding too. In fact, this speaker is so small that you carry it virtually anywhere without any issues, and it’s strong enough that it turns heads and elicits attention from people who marvel in disbelief at it’s phenomenal audio performance. It’s metallic and silicone construction also makes this speaker feel very high quality. All this coupled with an amazing budget price point makes the XSBOOM one of the best mini bluetooth speakers to date. The Taotronics is a small, compact and one of the most well-built mini bluetooth speakers which is high value for money. For its small size, it pumps out quality audio which can get pretty loud and crisp. The speaker is designed to be compatible with almost any Bluetooth device with Bluetooth 4.0 technology for quality audio streaming. The speaker is also built with intuitive lights which look pretty and communicate pairing status and other important messages. You can also enjoy up to 6 hours of play and talk time with the Taotronics speaker, and it also comes with a built-in microphone which allows for hands free calling. All in all, this is a simple and clean mini bluetooth speaker that delivers the portability and sound performance you need. We were pleasantly surprised by the sound and audio quality of this speaker. We charged it up and paired it with our mobile device. We found that the music is clear and crisp as are voice and sound effects. This little speaker actually gets loud – we wouldn’t recommend pushing it full volume all the time as it may distort a little at maximum volume. This speaker delivers good trebles and mid-range with little to no bass. That said, this is to be expected from a speaker of this size and we quite liked the sound signature of the Taotronics. As for all speakers, we felt that the speaker did require about an hour of break in for its mellow and clear sound to crystalize. The good thing about this speaker is that it comes with a multi-function wheel on the device which lets you change songs, change volume and answer/ make calls from this small speaker. If you want to change the volume, simply slide and hold it for a while to turn the volume up. We found this function pretty cool and intuitive to use. The LED lights that surround the outer rim of the speaker were nice to look at and they change color depending on whether the speaker is charging or paired (red for charging, blue when paired). An added feature is the small audio cord which you can use if you do not have Bluetooth. You can also charge this speaker via the included USB cable. The build of the speaker is rock solid and is available in both black and white colors. We liked the overall design of the speaker and it blends easily into the surroundings without being obtrusive – your friends will definitely be surprised to hear such loud and good quality sound from such a small and tiny speaker. To top it up, this speaker is extremely low cost and very easy to use. The Verdict? We really liked the feel and design of the Taotronics. It’s one of the cheapest and well-built mini bluetooth speakers in its category, and definitely represents great value for money for such a small Bluetooth speaker. The speaker delivers very good audio and sound performance for its size, although somewhat lacking in bass. The LEDs on the speaker make it really sleek and nice to look at. It’s also extremely portable, so you can take it virtually anywhere and it will blend into the surroundings easily. If you are looking for a low-cost but efficient option, this speaker is the one to look at. 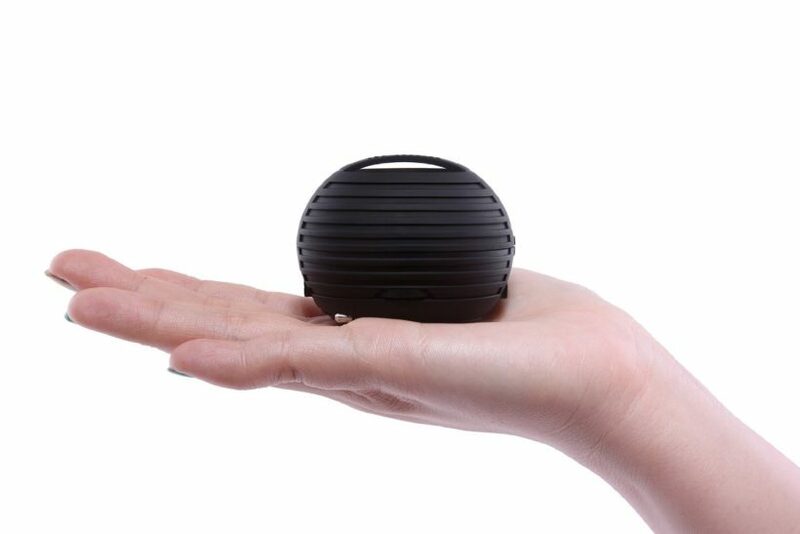 The JAM Plus by HDMX is one of our personal favourite mini bluetooth speakers and produces stellar audio performance in addition to its unique and sleek design. You can use this small bluetooth speaker from just about anywhere – from the kitchen or living room or office, or you can take it out for a family picnic or bring it to the beach for some extra music. This speaker includes a unique JAM2 feature, which allows you to connect the speaker to a second JAM Plus speaker to create bigger sound. The speaker itself measures 3 inches in diameter and 3 inches high, delivering very good sound performance in a small footprint. The JAM Plus also comes in an array of 5 different fun colors to choose from, so you can pick and choose the design that you love most. The JAM Plus is very clean and simple to use. It features a rechargeable lithium-ion battery that provides up to four hours of wireless streaming. The speaker also comes with line-in capability so you can connect your non-Bluetooth devices directly to the speaker. It also comes with an included micro-USB cord which makes it easy to recharge the battery – you can connect the USB to your computer or adapter and you are set. The Bluetooth connection allows you to connect from devices up to 30 feet away. You can also use the JAM Plus to take hands free calls on your mobile device. The sound performance of the JAM Plus is very good. Although they do not produce a sound as deep or bass heavy as desktop speakers, the difference in sound versus an ordinary laptop or cell phone speaker is astronomical. The sound is loud enough to fill an entire room, and the sound itself is robust, rich and solid. We liked the ability to connect this speaker to another JAM Plus to give bigger and much fuller sound – it’s a really fun and portable mini bluetooth speaker that you can easily take around on the go and play music anywhere. We really liked the appearance of the JAM Plus and sleek metallic color design. It looks very cute and comes in different colors that you can choose from. 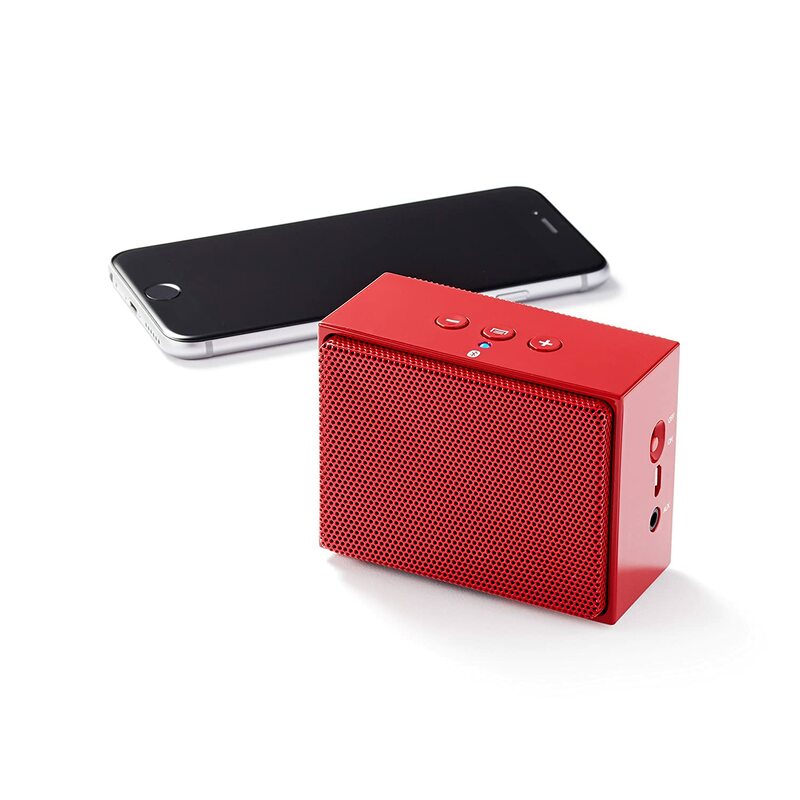 Pairing with this speaker is a snap – simply to go settings on your device and select the JAM Plus and pair it. The buttons for the sound, Bluetooth and battery level are easily reached and accessible on the speaker, and you can also control the volume from your mobile device. The Verdict? The JAM Plus are lightweight, solidly built mini bluetooth speakers and deliver very good sound performance and are extremely portable. You can even pair the speaker up with another JAM Plus to get double the sound and audio output. The speaker does produce very good music and can get very loud at maximum volume without much distortion. The speaker is also available in 5 different colors to choose from and have a sleek metallic finish that is eye-catchy and fun. All in all, the JAM Plus is a great mini bluetooth speaker that you should consider. The Roker S-Cannon is easily one of the best value and unique mini bluetooth speakers on this list. Apart from its award winning design and unique allow housing, the upgraded version features Bluetooth 3.0 and EDR for more stable connectivity and faster response rate, super enhanced bass and a built-in rechargeable battery that delivers up to 5 hours of playing time. The speaker delivers excellent sound performance with its 3W speaker and 40mm speaker driver. The built-in hands free function allows you to answer calls without delay and it also has a TF card slot to support mp3 music play. All in all, it’s one of the best value for money mini bluetooth speakers that offers style, performance and portability in a single package. On first sight, the Roker S-Cannon looks very good, compacted and stylish. The speaker housing is mostly metal alloy that gives it some heft while the button section is plastic with a sticky base that prevents the speaker from sliding around. Note that you have to remove the plastic protective sheet covering the bottom of the speaker to get maximum bass output. In terms of the audio performance, the S-Cannon performed above par, especially considering the price of this speaker. It plays louder than you might think possible and the bass is actually not bad particularly when the speaker is placed on a wooden surface. The wood gives the bass some additional resonance and improves the overall sound quality. We felt that this little speaker does pack a punch and sounded great through the Bluetooth connectivity. The Bluetooth connection with the speaker is very good. We did not encounter any static while playing music from our mobile devices. Connecting to the speaker from your mobile device is also very simple – just turn on your bluetooth to discover the speaker and connect to it. There is an on/off button on the bottom of the speaker and along the side of the speaker are the track/volume, play/pause buttons. There is also an AUX in port (3.5 mm cable) for connecting non-bluetooth devices to the speaker. A mini USB cable for charging is also provided. The speaker itself is very small and portable – its only 2 ¼’ in diameter and stands about 2” tall. That’s about as small as you can get. The Verdict? The Roker S-Cannon delivers superb sound quality and a very sleek design. It’s definitely one of the best value mini bluetooth speakers on this list, and comes with a host of upgraded functions such as enhanced bass, 40mm premium speaker driver, stable Bluetooth connectivity and intuitive buttons that make this speaker a breeze to use. Furthermore, the speaker also features an award winning “screw thread” design that looks sleek and elegant. 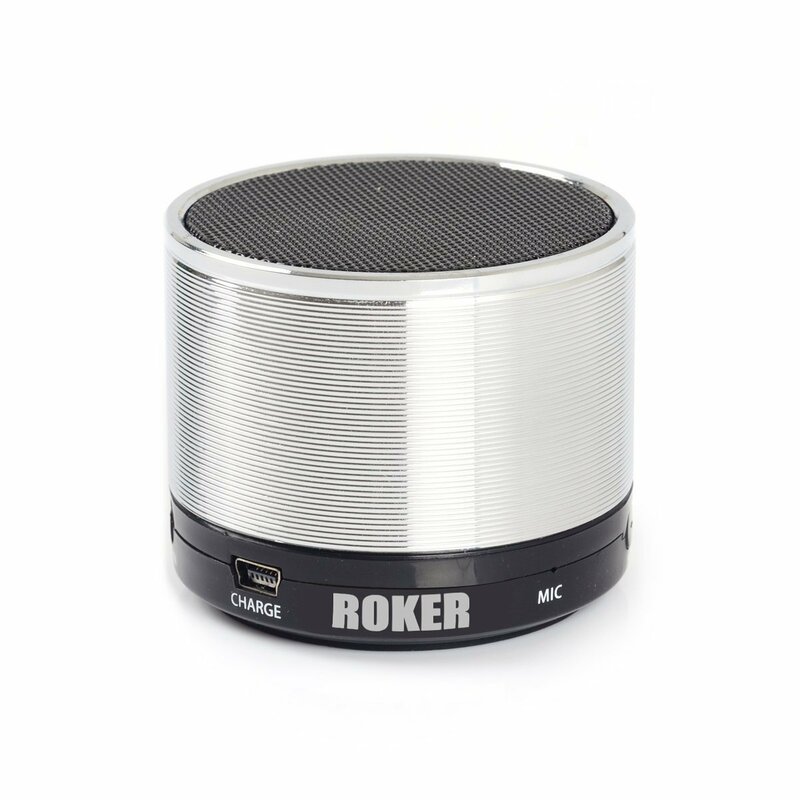 If you are looking for one the best mini bluetooth speakers at an affordable price, the Roker S-Cannon is definitely a great choice. The AmazonBasics are nice, sleek and fashionable mini bluetooth speakers that deliver quality audio performance and Bluetooth streaming. They are specially designed for portability so you can take the speaker anywhere and listen to your favorite soundtracks. The speaker itself contains one internal 3W speaker and built-in microphone for hands-free calls. It can connect to any Bluetooth-enabled device from up to 30 feet away or by using the 3.5mm stereo cable. The battery provides a whopping 10 hours of wireless play on a single charge when listening to music or making calls. The speaker itself is very small and compact, and is 3.3 x 1.7 x 2.6 inches. It also comes with a micro USB cable and carrying pouch. We found the sound quality of the AmazonBasics really good – you cannot beat it for the price. The sound gets plenty loud enough – if you turn the volume all the way up, you can clearly hear it from the next two rooms (About 15-20 feet away). The highs and mids were decent enough and were expected from a speaker of this size, with the bass a little lacking. We liked the fact that you can also use it as a conference call speaker with the built-in microphone. We also felt that this speaker was great for audible books – the voice quality is very high and crystal clear. All of the buttons and switches were easy to use and see. With the volume and a answer/hang up button on the top and the power switch, charging slot and 3.5mm speaker jack on the side. The bottom has some rubber ends to help keep it steady as the case is a very good grade plastic. We really liked the stunning colors of the speaker which adds to the overall visual impact; it also has a little ‘old school’ radio style to it that was fun. Wefound that the Bluetooth pairing was easy and the status indicators on the top let you know the status of the unit. Connectivity, charge and battery indication is all shown by the LED light on the top near the volume buttons. The speaker is designed to be clean and simple to use, and we did not encounter any issues with the user interface. It’s also compact and light enough to carry around in a backpack, luggage or jacket and have portable sound wherever you go. The Verdict? The AmazonBasics line of mini bluetooth speakers delivers the quality that we expected. The packaging was good and comes with the speaker, a charging cable and carrying case for the speaker. The speaker is extremely minimalist and lightweight – with the weight at just over 9oz it is good enough to be able to carry it around in your jacket pocket. It’s also quite versatile and can be used in conference calls. All this coupled with crystal clear sound and decent audio performance at low cost makes this one of the best mini bluetooth speakers that you can find. The SHARKK Ultra is one best looking and rugged mini bluetooth speakers that provides superb audio performance, and definitely comes highly recommended. It comes in an alloy steel rubberized housing for extra sturdiness and protection. The speaker can also produce broad and surprisingly loud sound range with enhanced bass, and a slip-resistant rubber base keeps it steady while blasting music at full volume. The frequency response of the speaker is 60Hz to 18KHz, and has a dimension of 2.36” x 2.28” which is really small and compact. This powerful mini bluetooth speaker also comes with a rechargeable lithium battery that supports up to 6 hours of consecutive playtime, and a built-in mic for hands free calls. The package also includes a USB charging cable and a 3.5mm audio cable. We have tested a lot of mini bluetooth speakers and feel that the SHARKK Ultra definitely deserves a spot on this list. Not only does it sound great, the quality construction and its features set it apart from the others in its category. The exterior is stainless steel and it is robustly built. This mini bluetooth speaker plays crystal clear sound and can go up to a volume that is very commendable for a speaker of this size. Not only does it carry the mids and highs well, it also produces nice bass and does not distort on maximum volume. It also does not produce any static buzz while connected on Bluetooth. It is also ideal to listen to your audio books or podcasts on this speaker due to its clarity and portability. The speaker can play your music three different ways which makes it a very versatile speaker. It has a Micro SD memory card slot so you can put a memory card directly into your speaker and play your songs without even using another electronic device. 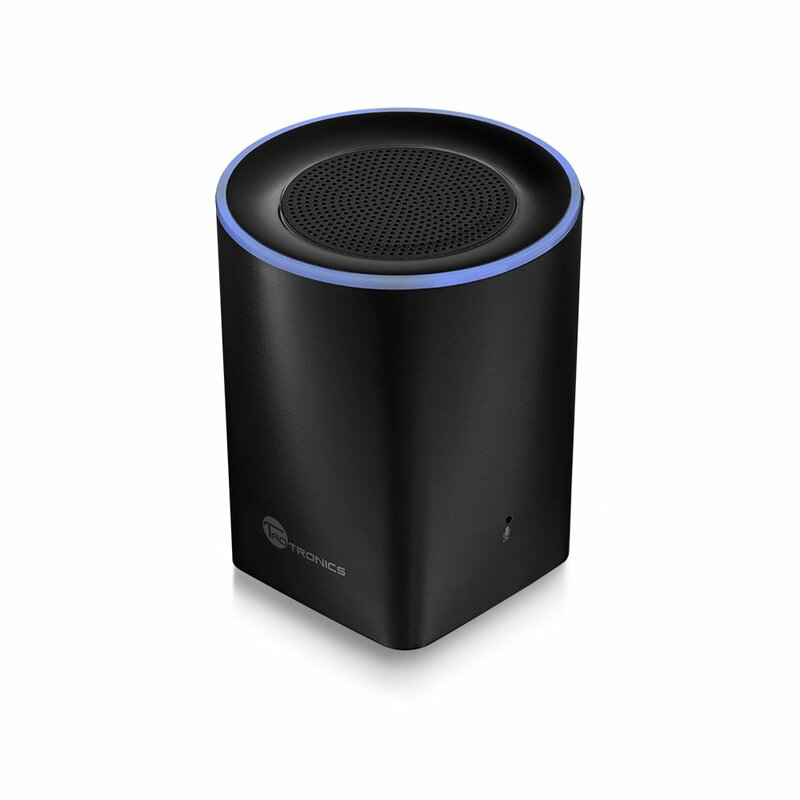 It also features Bluetooth 3.0 wireless connect-ability so you can connect it to your device and set it down and have it play music as long as you are within about 50 feet of the speaker. Bluetooth connection was fast and easy to accomplish. It will also play music with any electronic device with a 3.5 MM earplug jack can use the auxiliary cable to output your music to the speaker. The built in 430 mAh battery Lithium-Ion polymer battery can operate the speaker for up to 6 hours on a single charge. It is rechargeable using your computer’s USB port or any USB AC wall adapter that has a 5VDC power output and it will recharge in about 2 hours. The LED will be red when the speaker is charging and it will turn green when it is fully charged. The Verdict? The SHARKK Ultra is one of the best mini bluetooth speakers that you can find on a budget with very good sound quality. The speaker is ideal for its portability and produces high quality sound that you can enjoy with your friends. It also makes for an ideal gift for your friends and family that like to travel and listen to music on the good. We really liked the external metallic frame and design of this speaker which makes it feel very high quality. The fact that this speaker is so versatile and adaptive is definitely an added plus. The EasyAcc DP100 is hands down one of the best mini bluetooth speakers for its battery life and audio performance. It’s a super portable, uniquely designed speaker with sound openings on all sides to give omni-directional sound. The speaker contains a 4W audio driver that produces loud and clear music. It also features the latest Bluetooth 4.0 and CSR 8615 technologies which allows the speaker to connect to your mobile devices quickly and stably at 33 feet without obstructions. It also comes with an AUX function that allows the DP100 to play on any audio device via a 3.5 mm cable. Most impressive of all, DP100 has a built-in 2,200 mAh rechargeable battery that provides up to a whopping 25 hours of playback time and a built-in microphone for handsfree calls. At the time of writing, this incredible mini bluetooth speaker comes highly recommended. Our first impressions of this speaker were that it is one of the most powerful mini bluetooth speakers in its category. The speaker can go very loud, and by loud we mean that you can hear it 30 feet away while it is in another room. It is simply the loudest and greatest in sound quality, and has a much richer, fuller sound than other conventional mini bluetooth speakers. This speaker is excellent for parties or alternatively an office environment where you can keep the volume low and enjoy music with ease. The bass and clarity in songs are pretty decent, even at full volume without any distortion. The battery life on this speaker is an insane 25 hours (depending on the volume) which is by far the longest on all mini bluetooth speakers on this list. Aesthetically, the EasyAcc DP100’s look is really appealing with its sleek metallic finish on all sides. The speaker has very sleek grey and black colors all around. The design is very nice and premium looking, and the buttons on the top are of good quality and work nicely when skipping a song or pausing when your device is not within reach. Pairing the speaker is incredibly easy – simply turn it on and it automatically enters pairing mode. Use your device and pair to EasyAcc DP100 and you are done. As mentioned earlier, the features and battery life are outstanding and it even includes a handy carrying pouch to protect it from dust and water when carrying. It also comes with a micro USB charging port. The universal cable and the included cables (3.5mm and micro USB) are super high quality. The Verdict? The EasyAcc DP100 performs and feels like premium mini bluetooth speakers. We really liked the sleek and superb design of the DP100, and the sound performance of this speaker was quite good with decent bass and clarity on the mids and highs. We found that the sound also did not distort at high volumes. The battery life is a jaw-dropping 25 hours and is definitely among the best mini bluetooth speakers with the longest battery life from a single charge. Furthermore, this premium speaker is now selling at a very good price, so be sure to check it out! 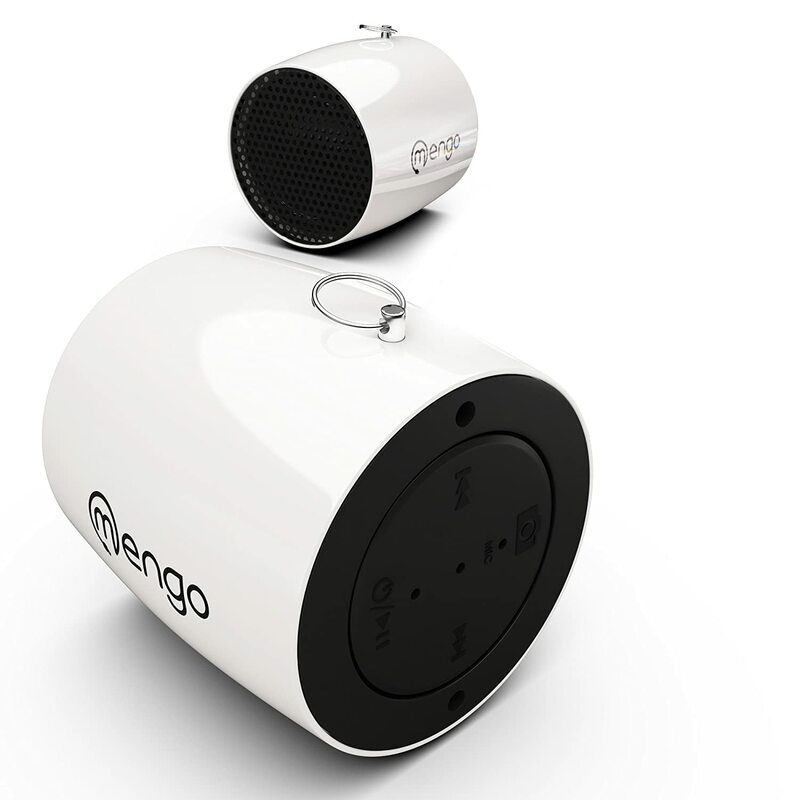 The Mengo Ultra Mini Drum is among the smallest mini bluetooth speakers we have ever encountered. 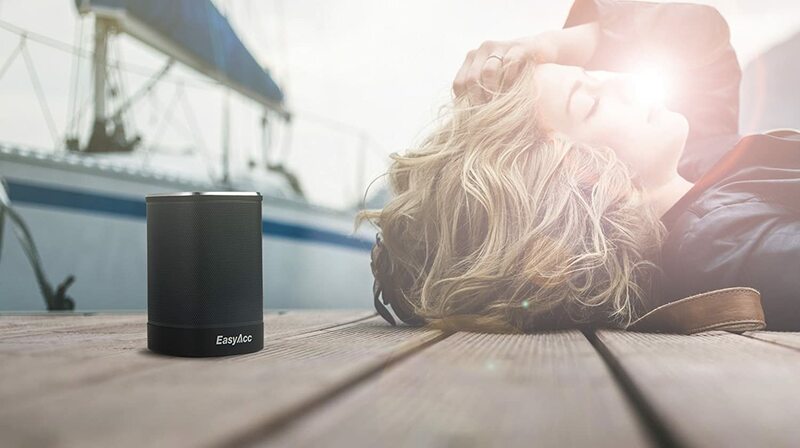 The entire speaker itself is a short 1 ½ inch drum-shaped and ultra-light (1.3 ounces) speaker that you can easily fit in your pocket or backpack or even attach to your keys. The Mengo Mini Drum has the ability to answer/hang-up/redial/refuse calls with the push of a button, and includes a new selfie feature which allows the speaker to be used as a camera button. 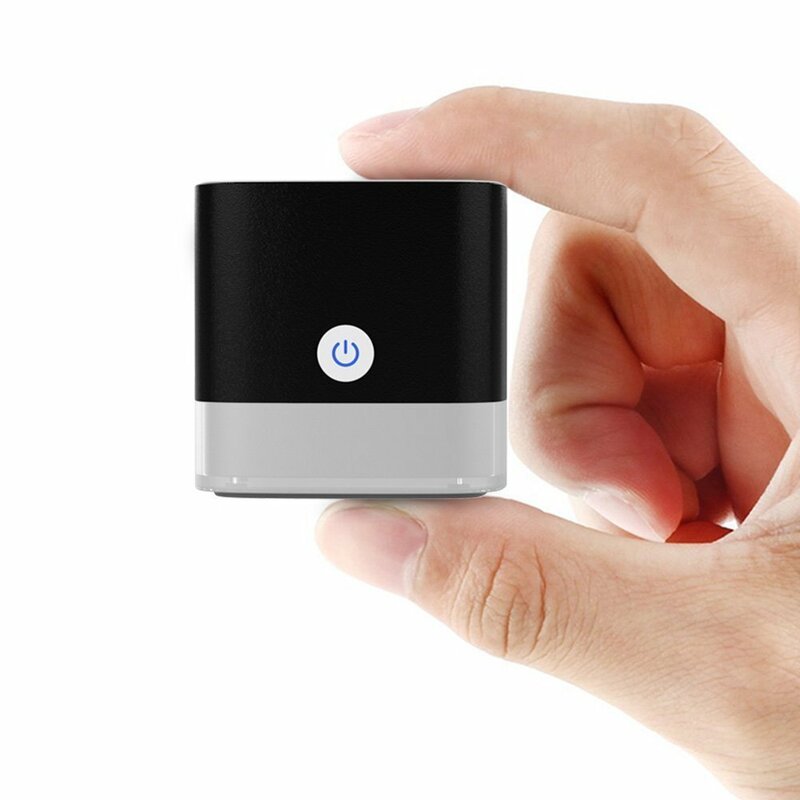 At the time of writing, this ultra-small bluetooth speaker is selling at a very good bargain price. The speaker is designed to be as small and compact as physically possible. On one end, you have the speaker grille (where the music or sound comes out), and on the other you have the control panel. On the control panel are the standard ‘on/off’ switch joined up with the ‘play/pause’ button, as well as the volume/forward and volume/backward dual function buttons. The special feature that makes this drum different is the Selfie button. The drum interfaces with your smartphone, allowing you to position your phone’s lens on whatever you want to snap a picture of and then press the button on the drum to capture the picture. It interfaces very easily through the smartphone’s camera application, and while some may not find it the most useful addition it’s still a nice addition to have. The sound quality of the Mengo Ultra Mini Drum is decent but nothing mind-blowing. The speaker does produce good and clear sound and the volume limitation works in places like an office where normal Bluetooth ranges sometimes fail. As a portable bluetooth speaker, this is actually quite nice to carry around. 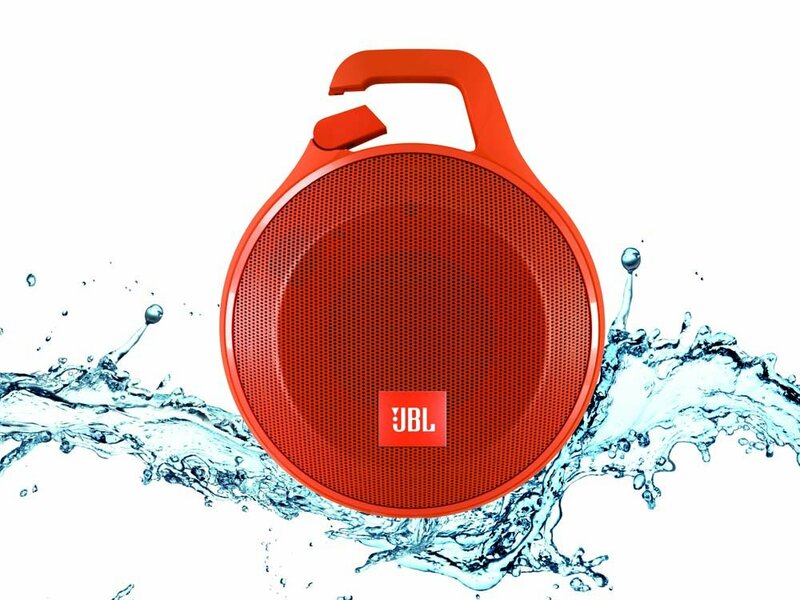 It’s certainly not the kind of device that fuels a party by the beach or poolside affair; rather, this is the kind of speaker that you can take anywhere you like and provide yourself and your friends with a nice listening experience while connected to your mobile device. In this respect, and because it comes with its own ring to attach your car keys if you like – it’s quite a neat solution. We also liked the microphone feature, which allows you to answer calls without the use of the phone. Considering the Mengo can fit on a keychain, this could actually be something of merit for you to consider. Another thing I like is the microphone feature, which allows you to answer calls without use of the phone. This helps when you are wandering around your home or goofing off, or are simply busy doing something else. Considering the Mengo can fit on a keychain, this could actually be something of merit for you to consider. To top it off, Mengo offers a nice, 1 year hassle free warranty as well. The Verdict? The Mengo Mini Drum is definitely something of a novelty and without a doubt one of the smallest mini bluetooth speakers we have ever tested. The sound quality of the speaker is decent enough for personal use, but not for large outdoor parties. The speaker itself is extremely compact, tiny and ultra-light, and is probably the most portable mini bluetooth speaker in the market. You can also conveniently attach it onto a keychain to take it wherever you need it. At the time of writing, this incredible mini bluetooth speaker is comes highly recommended, so check it out before it sells out! 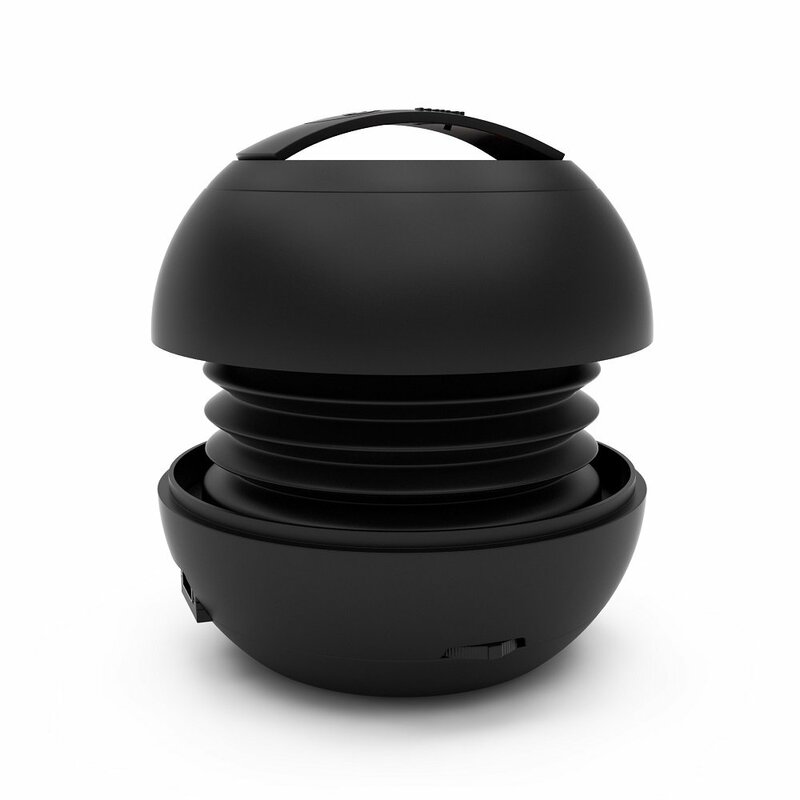 The BLKBOX POP360 is an amazing mini bluetooth speaker that produces exceptional sound in a tiny package. It has a nice and sleek innovative design with a “pop on” option that allows you to extend the speaker for added bass. The sleek black color and sharp LED lights also make this speaker stand out. The size of the speaker is small enough and compact enough for you to take it along in your pocket. It has up to 8 hours of battery life, and the built-in LED will also let you know when it’s time to charge. The design of the speaker allows you to get the best 360-degree sound with decent bass output. At the time of writing, the POP360 is selling at a highly attractive price point. We found that the size of the POP360 is about the size of a lemon, and is super easy to carry around with the extendable ‘pop on’ function. To turn the speaker on, you simply push the top and the core raises with a voice saying ‘power on’, which we found pretty cool. You can also close up the speaker simply by pressing the top down. The speaker will pair up with any Bluetooth device instantly and will instantly play music straight from your soundtracks. It also remembers your device and will be instantly accessible anytime you’re ready to fire up your music. We were quite surprised by the sound performance of the POP360 and how this compact speaker could fill the room with music. It sounds great with good clarity and we also enjoyed taking it outdoors to the beach or to a picnic. The speaker has high crisps and enough lows for us to be impressed that such sound could come from something so small. The speaker itself includes a mini USB cable and AUX input for devices that do not have Bluetooth connectivity. The built-in 3.5mm auxiliary jack is really convenient to use. The battery life is also quite good, delivering a good clean 6 to 8 hours of continuous playtime depending on the volume. The battery life is clearly displayed as the built-in LED goes from blue to red. 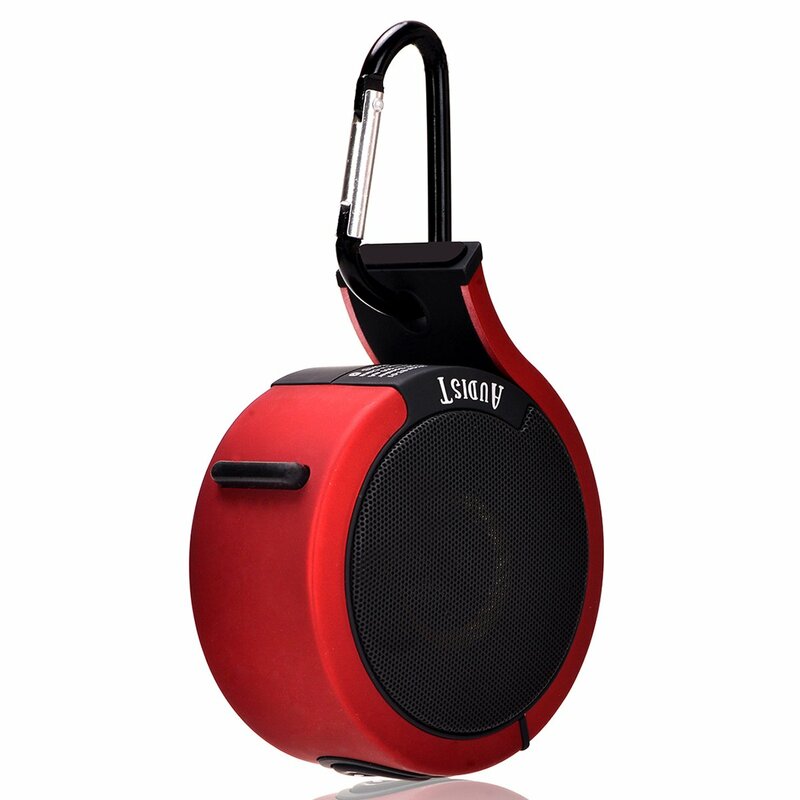 The speaker itself is light and small enough to carry in a small bag, purse of backpack. The Verdict? The BLKBOX POP360 has a very unique design and ‘pop on’ function that allows you maximum portability and can extend to deliver better sound and bass response. The highs and mids on the speaker are crisp and clear, and we experienced no bluetooth connectivity issues at all. The sound from this speaker is quite amazing given its size, and we really enjoyed the music coming from it while testing it – it’s also loud enough to fill a room and the sound does not distort near maximum volume levels. The speaker delivers exceptional value for money, so check it out before it sells out! Best Bluetooth Speakers in 2019: Which ones should you get?